If you like to follow fashion trends, or even if you just love to shop, you may have noticed a heavy 70’s influence in the collections for both spring and fall. You probably have seen an influx in flared denim, fringe accessories (THESE. SHOES. ), peasant-style blouses and dresses (love this one! ), vests and lots of suede. This is actually the topic I covered on my KXAN segment last week – check it out here if you missed it! While I love all aspects of the 70’s look, a pair of flared denim is the easiest way to incorporate this trend into my day-to-day wardrobe. I picked up this pair (now on sale!!) at the Stella McCartney store in Highland Park Village, and they’ve been a fun alternative to my regular skinnies during the week. Since this pair is such a light shade of blue and ideal for summer, I’m thinking I may want to pick up a pair in a dark wash (maybe this pair?) for fall. What are your thoughts on flared jeans? Skinnies are still my go-to, but it’s always fun to throw a new style into the mix now and then! These jeans were made for you. Love the shade and the cut! Yes, yes, yes! 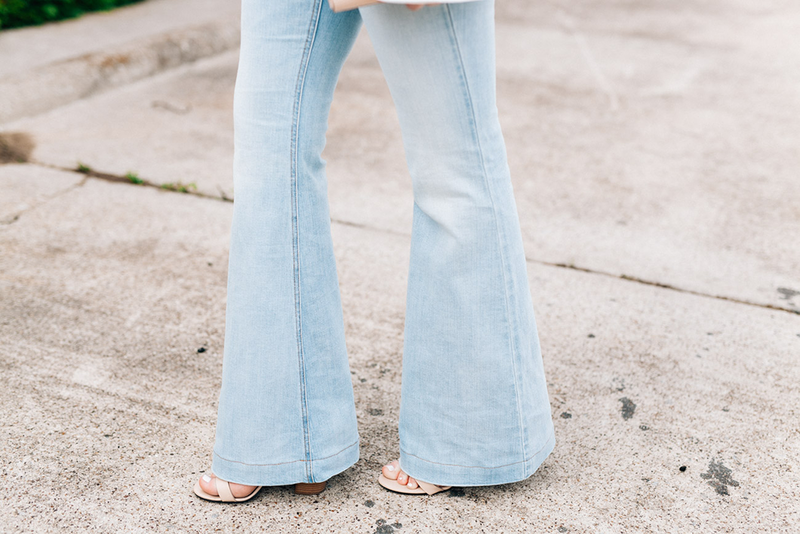 Light wash flares are so in right now and I LOVE them! These jeans look amazing on you & I’m really loving the lighter wash! fabulous flares! They look so so good on you. I really think I need to invest in a white blazer… Love how you styled this. The wash of these jeans is so perfect for spring. Love them with the white top and blazer! I love the lace cami and that blazer! I didn’t think flared pants could look chic, but you made it happen! I love this flare denim on you. The light blue shade looks beautiful with your white top and blazer. Great styling! Love this look! And those glasses are seriously killer!! I want pair like that so bad, so perfect for summer! Love your jeans and that you paired them with white for a clean look. Hi! I’m not sure where I’ve been in the fashion blogging world, but I came across your website and absolutely love your style. You dress timeless, classic, and totally on point! I love it! I’m so glad you found my blog! Thank you so much for the sweet words!! what a fun wall to take photos! those flared jeans are fantastic! Love the throwback vibe and that wall perfectly highlights your look! Those pants look sooo cool on you! This jeans fit you like a glove! Gorge! Perfection! Loving the light wash denim paired with a crisp white blazer! These jeans were made for you! I love flares and went from having a few pairs to somehow ZIP! Need to get a new pair. love the wash on these! 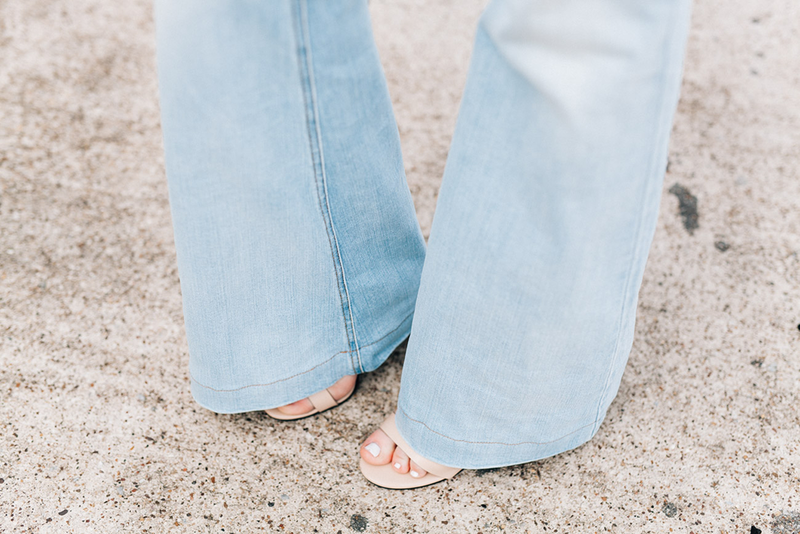 I love the light color of these flares and they fit you like a dream! Those flares are so lovely! What chic look! I love the flared denim – you made it look so modern and fun. 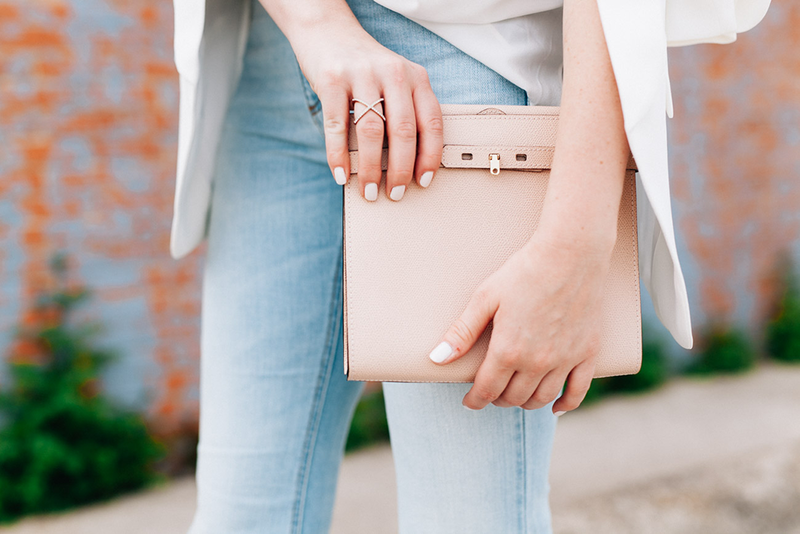 And that clutch is so dainty and perfect!! You look so chic! Love your flare jeans! I’ve been itching to pull out my old flare jeans and this look confirms that I must! You look so chic, as always! I really like this ensemble, I’m totally in love with flared jeans. I have a dark wash of James Jeans flares and I adore them. We ARE blog twins today! 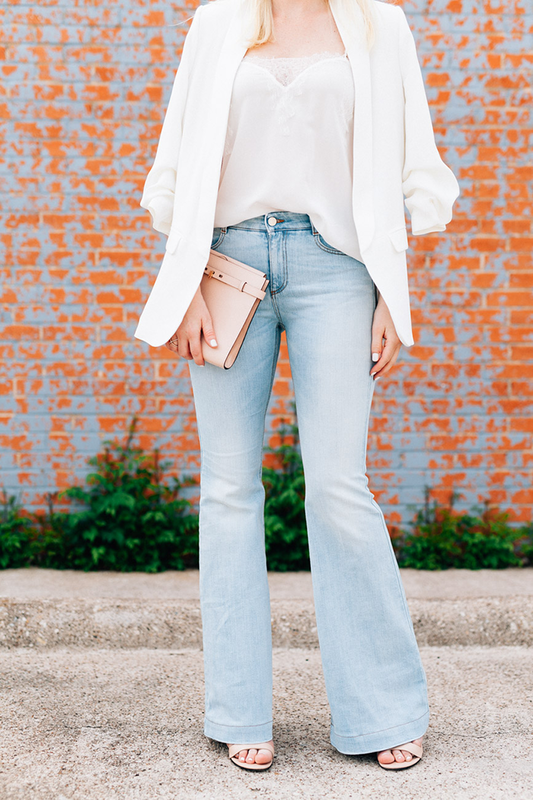 I love these light colored flares on you and the white jacket is the perfect way to style them! Loving those flares! They look so great with the blazer! Stella can no wrong, the wash an cut on these jeans are perfection, you look amazing! 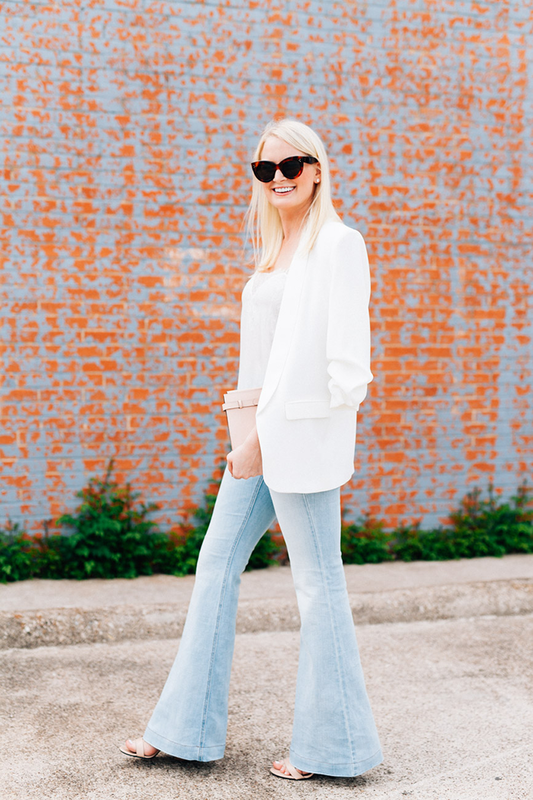 I’m loving flares this season but just like you they haven’t replaced my skinnies : ) This pair looks amazing on you, I love the lighter wash with that white blazer! That bag is so chic, I also love the sunnies! !